Florida has an abundance of marine life and among them the Florida Spiny Lobster. Many of our customers like to harvest for Lobster. 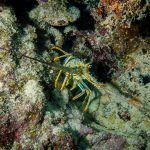 There is an abundance of Florida Spiny Lobster that you will see on every dive on the Key Largo reef. 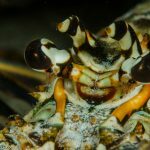 Lobsters that you see on the reefs are often inside the Sanctuary Protection Area and you are not allowed to hunt for them but we know where to go to find them. Our captains and crew think like lobsters and know here the most likely places are for lobster at specific times and weather conditions. The main season for hunting lobster is between August 6 and March 31. There are a number of restrictions relating to size and number. You should check the Florida Fish and Wildlife conservation commission for details. There is a special mini season that is always the last consecutive Wednesday and Thursday in July where members of the public are allowed to have first take of the spiny lobster, again there are restrictions to this so you should check the Florida Fish and Wildlife conservation commission for details. lobsters take them. We leave our engine on and stay a safe distance away. If divers cannot find any lobsters they return to the surface and we pick them up and put them back in another location. This process is continued for the duration of the two tank dive. All lobster divers must have a lobster measuring device in the water with them and must measure lobsters prior to putting them in a bag and landing them on our boat. Great care should be taken when capturing and measuring each lobster. The lobsters are brought back to dock live and whole. We do ask that you take your catch away with you live and supply bags for this purpose. We run special regular lobster trips during the season for $110 per 2 tank dive. Our boats have a license that covers all passengers who wish to harvest lobster. Full boat charters for the mini season are also popular at $650 for an AM or PM trip. The boats can take up to 12 divers and come complete with an experienced grew who can take you to some of the best spots so come and have a lobster party! These trips are booked ahead of time so it is advisable to book as early as possible.